I tend to be (a bit) of a fabric hoarder, so it is nice to be working on a project where all of the materials are coming out of my existing collection. Seeing my piles of stash fabric grow shorter makes me really happy. 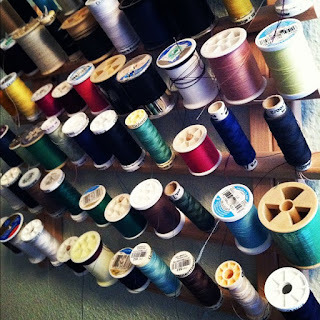 I had forgotten that I will have that same gratifying experience with my thread collection! Some of these spools have been with me since I started quilting in college, and have moved with me from one studio, to my parent's house, to our first studio apartment as newlyweds, to our first "real" apartment, rental house, and now, our family home. I think it is time to use some of these old threads up! 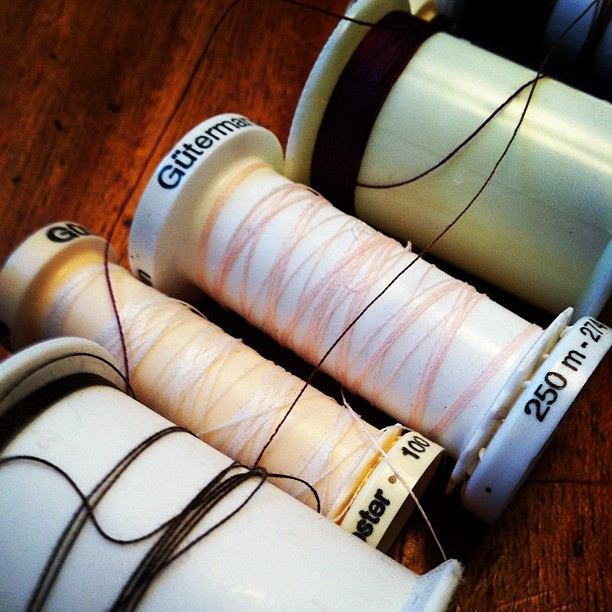 I was a little surprised at how many spools on my rack had just a few yards of thread left on them. Make do and mend, right? I am using up the spools with the least amount of thread on them first. For this part of the stitching, because of the way the blocks are ironed, no one will ever see what color thread I am using. I have already emptied four spools in just a few minutes of sewing! Over the last few years I have switched over from Coats to Guterman thread, and am looking forward to replenishing my spool rack with a variety of new colors. For some odd reason I have five full spools of Kelly Green all-purpose sewing thread. Not sure why, but I think I will try to put a dent in one of those next!